Venice is a true orphan as he has no mother or father. He came from the same village in the Western Region as Mary. Mama Pat had visited the village for a funeral. She was told about this child in desperate need of care. He was living with his ailing Grandmother. She was very old and in need of care herself. Venice would go to the beach everyday and follow the fisherman. When they would bring the fish to shore he would grab any leftovers he could find. This was what he survived on. He had no care during the day and would only come home to sleep. When Mama Pat found him he had no clothes. His hair had never been combed or cut, he had never brushed his teeth and his nails were terribly long. 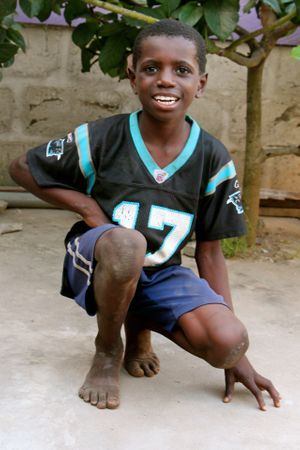 Before Mama Pat could bring him to the orphanage she had to purchase a set of clothes for him. It took a week of deworming medication to rid him of all the worms inside his body. Had Patrick not found him, it is likely he would not have survived. When he first arrived at the orphanage, it was thought that he had an extreme learning disability. Now he excels in school. He is a very hard worker and does his chores with great pleasure.